Wow. It's been a looooong time. Ok, so as you might or might not know, I love kidrobot. This store contains not just its own merchandise, but also numerous other artistic toys, clothing, bags, and books. One of these other labels is Friends With You. FWY is an amazing company. 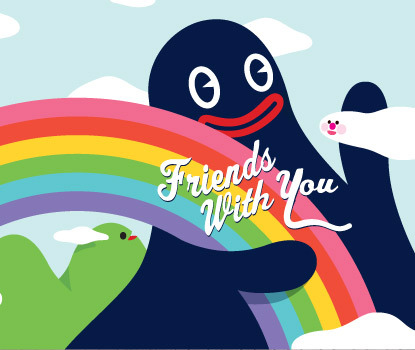 The Miami-based artists that created this brand have done an outstanding job promoting Friends With You through toys, art, apparel, film, and events. If only I could go to Miami and see Rainbow City, an art installation in Miami's Design District, or go to Taiwan to see the massive Field of Dreams art piece on the side of a building in the city of Taipei.